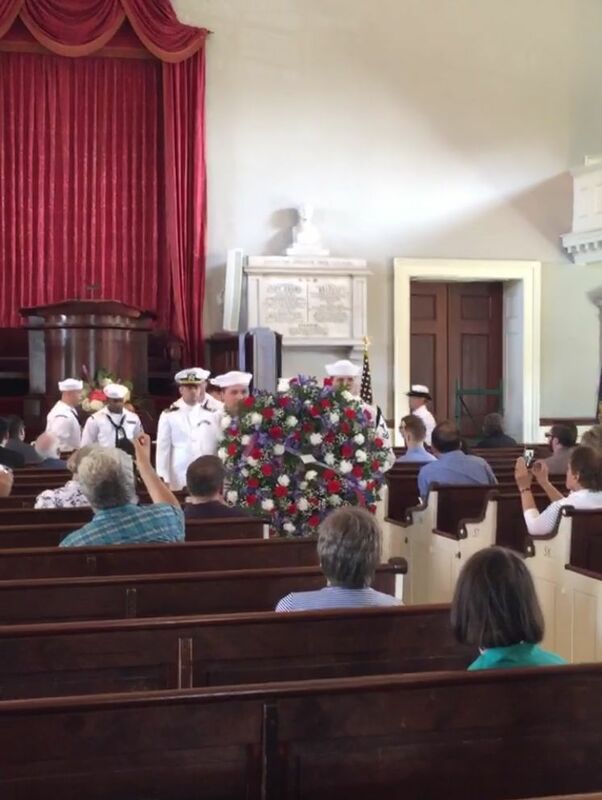 This month also marks the fiftieth annual presidential wreath-laying ceremony for John Quincy Adams at the United First Parish Church in Quincy. The tradition was initiated by Lyndon B. Johnson in 1967, establishing that on the birthday of each deceased president the current sitting president would send a wreath to be laid on his tomb. 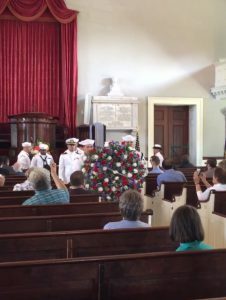 As a Graduate Fellow at the “Church of the Presidents,” I was able to attend several of these ceremonies as well as sharing the story of the Adamses, their congregation, and their final resting place with visitors from all over the world. John Quincy Adams is interred beside his wife and his parents at the First Parish Church, built in 1828. 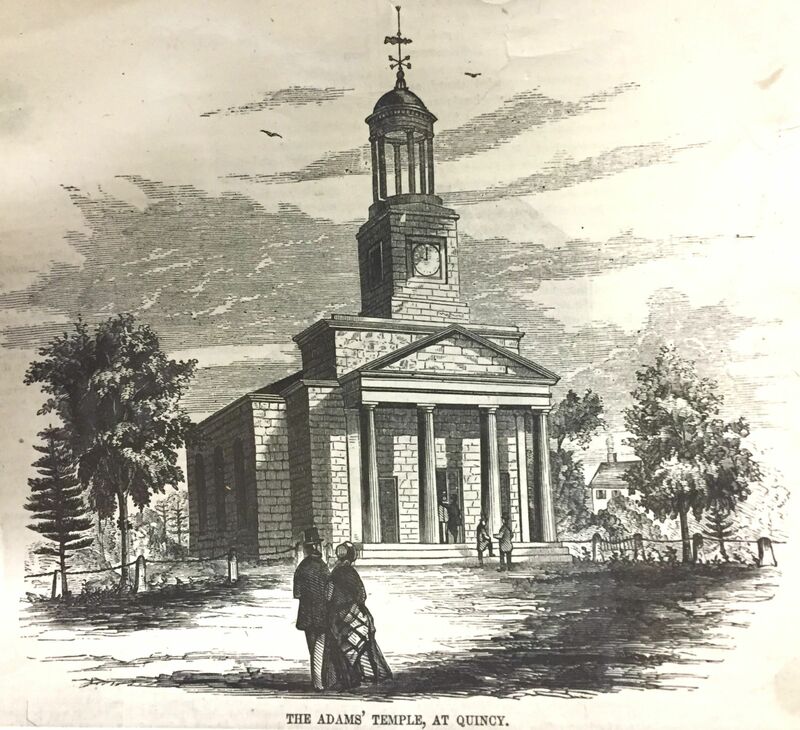 After the death of John Adams in July 1826, John Quincy, then president, wrote urgently, asking that the committee not delay on the construction of a new church and requesting that he be permitted to erect a “plain and modest monument” to the memory of his father. Nine months later the cornerstone was laid. On 1 April 1828, John and Abigail Adams’ remains were moved from the Hancock Cemetery across the street. 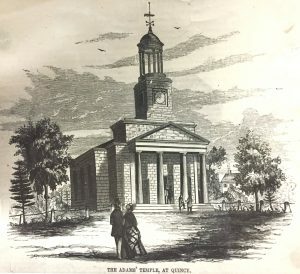 The church was dedicated in November 1828, during Adams’ bitter bid for reelection against Andrew Jackson. John Quincy Adams died in Washington, D.C., on 23 February 1848 and was returned to Quincy where he was laid to rest in the Hancock Cemetery. Upon the death of his wife, Louisa Catherine (Johnson) Adams, in 1852, their son Charles Francis Adams requested that the couple be laid to rest beside John and Abigail. The modest tomb was enlarged and the sixth president and his wife were interred there in 1854. The “Church of the Presidents” is unique as it is the only building in the nation in which two presidents are laid to rest. As such, it has the honorable charge of hosting two presidential wreath-laying ceremonies each year, in July and October. The ceremonies are free and open for the public to come and celebrate the lives of the presidents. All are welcome to attend. John Quincy Adams wrote on 8 September 1826: “Upon the decease of my late honoured Father, I have considered it a duty devolving upon me to erect a plain and modest monument to his memory; and my wish is, that divested of all ostentation it may yet be as durable as the walls of the Temple, to the erection of which he has contributed, and as the Rocks of his native Town, which are to supply the materials for it.” Adams to Thomas Greenleaf, Adams Papers, Massachusetts Historical Society, Boston (available via NARA Founders Online, founders.archives.gov/documents/Adams/99-03-02-4739). Very interesting Danielle. I’m surprised I never heard of this before.If it weren’t for you I probably would never have known about it. Thanks for this information about John Quincy Adams and his father (who is my favorite Founding Father), and the church where they are buried. I was surprised to find out through Charles Francis Adams’s diary that when he and his father visited Nantucket in September 1835, they spent the afternoon with my 4x great-grandfather, James Athearn, plus his son-in-law and brother-in-law. The Adamses also stayed at the hotel owned by James Athearn and run by the Sheriff, Elisha Starbuck—which C. F. Adams described as “indifferent,” and which burned down the following year. As an Adams descendant, I was delighted to have received this today. I have forwarded it to my family and interested friends, and commented on my lovely visit to the church several years ago at which time I was allowed to sit in the Adams private pew. There is one omission, both JQA and Louisa went to the Congressional Cemetery first, before being interred in the church in Quincy. John of course died in the House of Representatives, literally, and the body was taken to Congressional Cem before being moved to Quincy. Thanks for this great post, JQA is my favorite ancient ancestor, and I have read much about and by him…an amazing human! Thank you for this wonderful reply … there are so many facets to JQA it’s difficult to pick which one/s to discuss…I love the quote, thank you for that also. Mine, as a genealogist, is “We are who we were.”, stated by him during the Amistad trial. I am also a Bemis descendant and had not seen that quotation before, another excellent one. Hal I am just now seeing your response on this post, I love this quote too and when thinking of my Adams genes, I should remember this one, it’s not the strongest of the Adams genes I inherited!!! Receding hairline yes, not always monitoring my mouth, not so much!